Best Bar | The Shanty | Food, Etc. Of all the beer joints, in all the towns, in all of Humboldt, voters liked The Shanty most. If you're keeping score at home, that's a hat trick with back-to-back-to-back wins for the Eureka dive bar with the key lime facade and iconic Martini glass neon out front. You don't three-peat by dumb luck. A lot of walks of life do their elbow-bending at this bar, where even four-legged best friends are welcomed. You could call it the Star Wars cantina. Sud sippers appreciate the reasonable prices, the edgy art on the walls and the courtyard out back with its ping-pong table and canopy that serves as a refuge for smokers. And all the Tin Woodmen in search of a heart need look no further than the jukebox. The Shanty has refused to change over to the popular digital jukeboxes, and patrons can suggest and bring in their own music. You'll find everything from scatting jazz vocalists to muscle car rockabilly as you flip through the jukebox's CD cards. Plus, come on: Who doesn't like a place where everybody knows your name? (Yes, I know, that Cheers reference was a hackneyed party foul, for which I will gladly drink.) But it's true. The camaraderie is so strong at The Shanty that long-time Eureka resident Pamela Foster wrote a book about it, "Bigfoot Blues," that mostly takes place at the bar. She even kept the real name of one of the bartenders who works there. Foster says you can't tell from the story, but she's not the type of person who likes hanging out in bars. 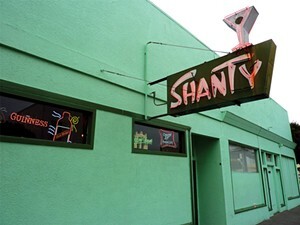 "But at The Shanty it's different," she says. "It's just very down-home and straightforward. It's like the Eureka I grew up in, in the '50s and '60s." Clink and bottoms up to you, Shanty. The Breakdown: The Shanty 15.1%, The Speakeasy 8.7%, The Local 7.5%, The Alibi 7.0%, Everett’s 5.7%. Category popularity: 12th.